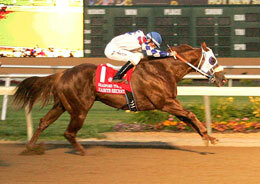 Habits Secret, under jockey Yordanis Amaro, winning the Bradford Sakes on Saturday at Grand Indiana Grand Racing & Casino. SHELBYVILLE, IND�JULY 5, 2014�Competing in the seventh running of the $43,000 Bradford Stakes was a question mark for Habits Secret earlier in the day. The four-year-old sorrel horse had been battling foot issues and an abscess could not be maintained by owner-trainer Ricardo Martinez. However, a last minute visit by a special farrier from Kentucky took care of the issue and sent Habits Secret to the winner�s circle Saturday, July 5 at Indiana Grand Racing & Casino. Habits Secret looked tough on the track. The son of NO SECRETS HERE broke well out of the gate from post one and secured the top spot early for rider Yordanis Amaro of Cuba. It was up to his opponents to catch him in the end, a task that they could not do. In the end, Habits Secret was able to hold off a late rush by Joltin Jess and Shanley Jackson to take top honors in the Bradford Stakes. Last year�s Bradford Stakes winner, Finche, finished third for jockey Debbie Freeman. Habits Secret increased his career bankroll to more than $284,000 with his win. He now has seven career wins, three of which have been turned in over Indiana Grand�s track. Habits Secret completed the 400-yard dash in a time of :19.694. He paid $7.60, $4.00 and $2.80 across the board.